The Ohmato-Shiki ritual archery ceremony was very significant rite for both the nobles and martial elites in the Samurai class. Nowadays, it becomes the crucial rite for the Ogasawara school and all the apprentices who belong to it. The word "Ohmato" itself means "a big target". 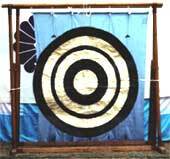 This rite, it is always performed by the expert archers who are specially appointed for this ceremonial occasion. Their aim is to sweep the vicious evils on the earth away (exorcism) and to show the God and people a dignity and the supernatural of a bow and an arrow, therefore, various physical movements are taken in the rite to signify faithful prayer hearts for the peace, happiness and prosperity of the nation, Japan. The Ohmato-Shiki archery rite as a solemn prayer, it has been usually carried out for the New Year celebration and a start of the annual archery ritual ceremonies.